The immediate lessor of these houses - vacant in 1850 - was Lord Congleton who we've already discussed in connection with No. 19, Market Square. Both houses were built by John Higgins who lived opposite the courthouse in Main Street. He is listed as a publican in the Cancellation Books (1870) and in Slater's Directory of 1881 and 1894, as a confectioner/grocer & spirit dealer. And according to Eddie Boylan, he also had jarvey cars for hire. But what is certain is that the adaptable Mr Higgins set the house on the left to Thomas Conroy, a shoe-maker. 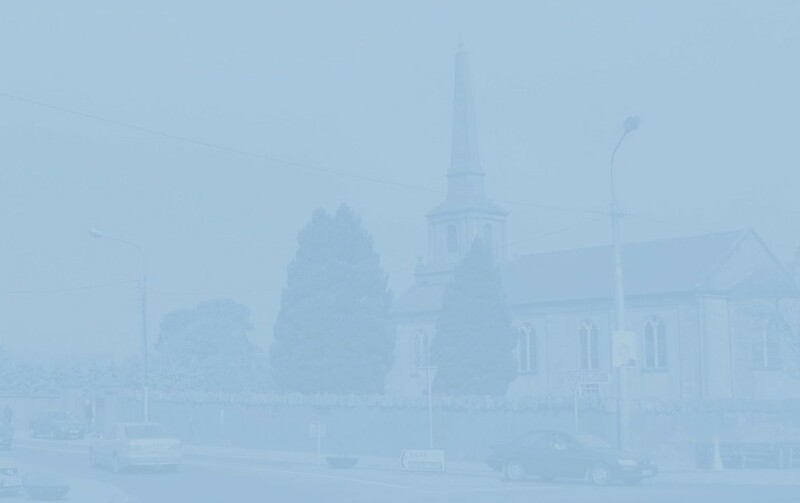 On Census Night 1901, Mr Conroy who, in the 1870's and '80's had lived on the Dublin Road, was here with his wife Mary, two sons - James and Bernard, both shoe-makers as well - and a young granddaughter, Margaret Morrin. In 1911, the household also included a "relative" James McEvoy who, at fourteen, was already a shoemaker. In later years, James Conroy lived here with his wife Norah and children Mary and Thomas. In the early 1950's, Mrs Conroy ran a small flower and vegetable shop which also sold home-made jam and country butter. She also made wedding bouquets. James Conroy eventually sold the house to James Whelan, a pig and cattle dealer (in the parlance of the times, a 'jobber'). He was brother of Patrick (see below), William, Thomas, Anne, Kitty and May Whelan. In the memory of some of my informants, James was a renowned ballroom dancer. In 1971, the Conroy name returned when Thomas, cousin of the above family, moved here from the New Road1. It was this Thomas and his brother Joe who owned the garage referred to on the previous page. He and his wife Olive had four daughters, Orla, Rosaleen , Pauline and Joan. The family sold the house in the late 1990's and, since then, the premises have housed a car accessories shop, Clement Herron's Real Estate business, and, from 2013, IT Vision, a computer shop. 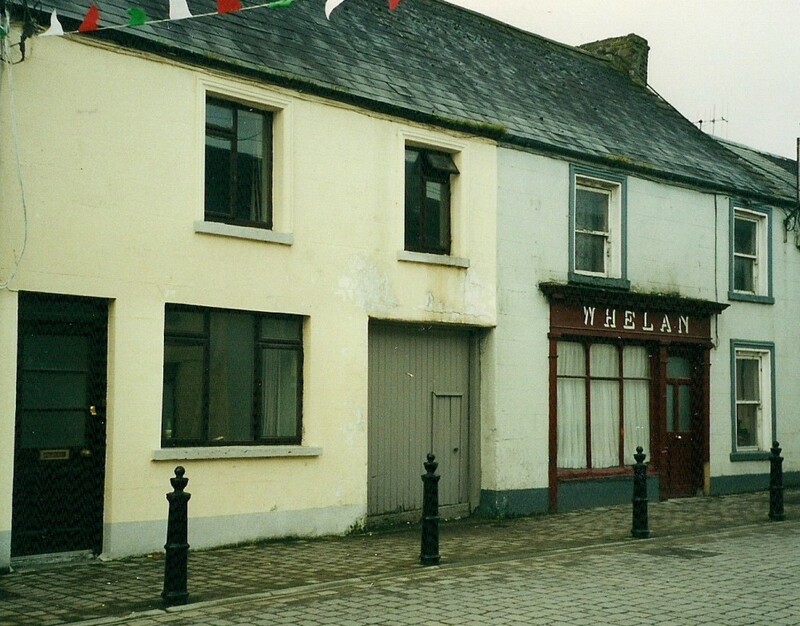 In the 1870's, Whelan's was the home of Abraham Case2 who we've already met as an old man living with his daughter Mrs Annie Madden in No. 20, Market Square. The next occupant was Francis Morrin, presumably related to the young girl mentioned above? In 1901, the Gavin family was living here; widowed mother Anne, sons James and William, and daughters Catherine and Anne. The last-named, a scholar, was the only one not listed as a vegetable dealer. On Census Night, 1911, Anne, a shopkeeper assisted by her daughters, was still here. Also present was Margaret Carroll, a thirteen-year-old domestic servant. Anne Gavin died in 1924 and William - who by 1911 had opened his own greengrocers across the street in Number 14 - in 1941, His brother James died in 1949. Catherine 'Katie' Gavin married Patrick Whelan and the family was always known locally as the Gavin Whelans. She died in 1974 aged 94. In its final years, the shop was run by the abovementioned May Whelan. The premises were vacant until the arrival of Polski Sklep, a Polish grocery shop in 2008. This was followed - August 2012 to May 2013 - by Subvert, a trendy clothes shop, and, in February 2014, LA Laser Clinic where the lads among you can have a chest as smooth as the proverbial baby's bottom for a mere €149, while the ladies, for €179, can sport a Brazillan just in time for the World Cup Finals. The Laser Clinic was replaced (2016) by the enigmatically-titled House of Fades Barbershop. 1 The Conroy family came originally from the Downs. 2 In 1850 he was living on the Well (later New) Road.